By Peter Anderson Leave a Comment - The content of this website often contains affiliate links and I may be compensated if you buy through those links (at no cost to you!). Learn more about how we make money. Last edited August 27, 2014 . For the past few years my wife and I have been using You Need A Budget as our main budgeting software for our household. I am a big believer in the zero-based budget where you allocate every dollar of income to a spending, saving or giving category. YNAB gives you an easy way to setup a zero based budget that's easy to track, so not a single cent of your family's money goes unaccounted for. YNAB has served our family well, and it has really helped us to improve our financial well being. I've heard the same from others. The team at You Need A Budget recently announced that they are going to be doing something pretty incredible. They are making YNAB free for college students. 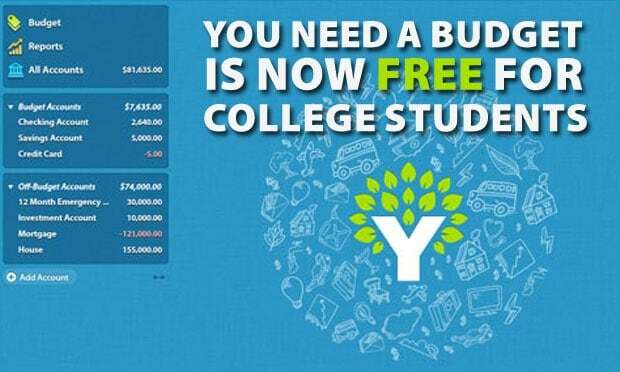 Jesse Mecham, founder of YNAB, posted on the company's blog that they wanted to help college students avoid graduating with crippling debt, and as such they are making YNAB free for college students. More kids are graduating from college absolutely weighed down by student debt. I don’t know what portion of their debt is avoidable, but I’m confident that if those students were following YNAB’s Four Rules, they would graduate with less debt. Starting today, if you’re a college student (even only part-time), we’ll let you use YNAB for free while you’re in school. So if you're now enrolled in college, as an undergraduate or graduate student, you can get a free copy of the best budgeting software out there (normally $60). What does YNAB get out of it? They get to help a group of people that typically is saddled with a large amount of debt to do better with their finances, and in the long run I'm sure they're confident that the students will convert to be paying customers once they graduate. So if you're a student, how can you can your free copy? Read on. They’ll email you a special license key (essentially an extended free trial key), good until the end of the calendar year. At the end of the year, just shoot them another email with proof of registration for the coming year, and they’ll send you a new license key that’s good for the entire next year. So in other words, as long as you're a student, you'll get YNAB for free. We've been using YNAB as our main budgeting tool at our house since we came upon it a few years ago. Here are a few reasons why. It simplifies a zero based budget: YNAB is built around the idea of using a zero based budget. Every dollar gets a job and is assigned a spending, saving or giving category. No dollar goes unaccounted for. Unassigned money doesn't go missing: In typical budgets some money that isn't slated for spending or saving categories often goes unassigned. Unassigned money often just gets spent. YNAB helps you to make sure all money is assigned. It helps you get ahead of the game: YNAB helps you to plan ahead, saving for future expenses, and getting to a point where you're living on last month's income, instead of living paycheck to paycheck. It has reduced our financial stress level: Since our budget has simplified our financial lives, it has helped to reduce our month to month stress level because we have a better handle on our financial situation. YNAB is built upon 4 basic rules. Rule 1: Give Every Dollar A Job: Every dollar in your family budget gets assigned to a spending, saving or giving category. When you assign the money, it has a harder time just disappearing. Rule 2: Save For A Rainy Day: Instead of being surprised when large expenses pop up at the end of the year (insurance, taxes, etc), instead save ahead when you know those expenses are coming. Set aside what you need to pay those expenses throughout the year, and then you'll have the money ready and available to pay those bills when they come due. Rule 3: Roll With The Punches: Realize that your budget is never going to be perfect, and that it's ok to roll with the punches and start fresh every month. Find the budget is off? Adjust it and start fresh the following month! Rule 4: Stop Living Paycheck To Paycheck: YNAB aims to stop the cycle of living paycheck to paycheck, and instead get people living on last month's income. Get ahead of your current paychecks, and live on what you earned last month! So when you're living by those 4 rules, you'll never fall behind because you're constantly planning ahead and saving up for contingencies that might occur. Here's a video review I did of the software a while ago. You Need A Budget is a great budgeting software, and I would highly recommend it to anyone. It will help you to get more organized with your finances, and your level of stress about your money will decrease. Students are now able to get the software for free for as long as they're enrolled in school, whether as an undergraduate or graduate student. Just follow the directions found above. If you're not a student you can still get a discounted copy of the software. If you buy the software through my referral link below, you'll receive a $6 discount off of the normal $60 price. The cost of the software is well worth it! Get started with YNAB today! Last Edited: 27th August 2014 The content of biblemoneymatters.com is for general information purposes only and does not constitute professional advice. Visitors to biblemoneymatters.com should not act upon the content or information without first seeking appropriate professional advice. In accordance with the latest FTC guidelines, we declare that we have a financial relationship with every company mentioned on this site.